Kagami and Tsukasa join Konata and Ms. Kuroi in the virtual world of an online role playing game and we get to witness firsthand the newbie experience in an MMORPG. 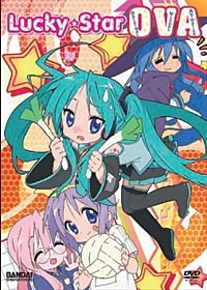 Am I dreaming or is that really Kagami cosplaying as Miku Hatsune?! If that and the surreal frog scene are just too weird for you, the girls also do some common everyday stuff like play volleyball and go camping. Stick around for the ending credits as you'll be treated to a special episode of Lucky Channel where you'll see me, Minoru Shiraishi, and Akira Kagami live in person! Special Features: Special Live Recording of Lucky Star Channel Radio Show, Special Lucky Star Event at Washinomiya Shrine.